One Wednesday each month we are featuring one of our Territory Managers. This month we're introducing you to Ohio native Brian Lambert, who covers the mid-country territory of Michigan, West Virginia, and his home state of Ohio, or, in his words, “The heart of it all.” He enjoys selling Spectrum’s high-quality products with “a wonderful reputation in the field.” “That, combined with the reliable, hard-working inside sales team, makes my job a lot easier,” he said. But don’t think he rests on those laurels. Brian works hard to get Spectrum products into schools and businesses throughout his territory. What sells the best for him, and why? “I’ve had great success selling mobile computing carts to the K-12 market. They’re feature rich and offer many advantages over our competitors’ products,” says Brian. Brian has a BBA from the University of Toledo. 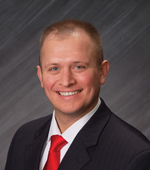 Prior to joining Spectrum, Brian originated residential mortgage loans and administered purchase and refinance closings for title companies throughout Ohio and Michigan. Outside of work Brian spends his time with his wife, Becky, and two young children. His hobbies include cooking, working out, and following sports and politics.